iris may mcginnis (me) is a humanbeing trying to stay human. I began looking for and trying to build sustainable community in the Back-to-Land and anti war movements in the 1960's and in the Women's Movement in the 1970's. I began support groups for working class women, started working with Reclaiming on the first Spiral Dance in 1979 at the beginning of that community and participated in a long term affinity coven involved in direct action politics. I worked in various direct action and social justice movements through the 1980's, often living collectively. 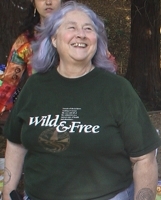 In the 1990's health issues caused me to slow down and move back to the country where I was involved for a number of years in the Mendocino Environmental Center and Parents For Peace. In 2004 I became involved with the Association Building Community Council and moved to the San Francisco Bay Area to be more accessible to trainings in Nonviolent Communication, class, social action, race, etc.